The Velocity Exercise Magnetic Rower allows its users to get a highly effective workout in the comfort of their own home. 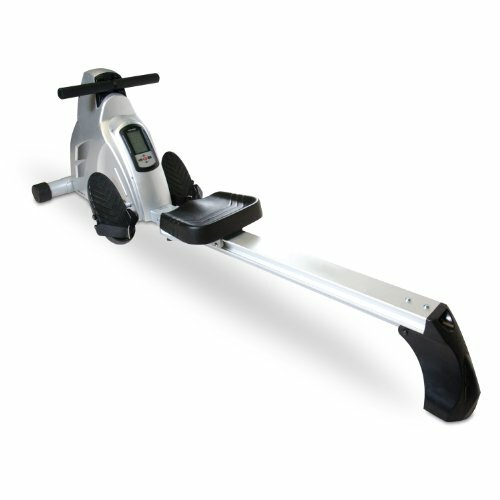 Featuring a Drum Magnetic Control System, or DMC for short, an electronic tension control, and a foldable frame that makes it convenient for storage when not in use, this rower is great for both novices and enthusiasts alike. This particular rower has 8 levels of resistance, which makes it yet another feature that would be appreciated by everyone, no matter their skill or fitness levels. The rower has a large PU molded seat that is extremely comfortable, allowing you to workout for extended periods of time without the worry of discomfort. The rowing oars have padded handles for a comfortable grip that will make your workout less painful. The beam is made of an anodized aluminum profile and a rectangular tubing support. The Velocity Exercise magnetic Rower also has a computer with a backlit LCD monitor with 5 functions, which are your workout time, stroke count/per minute, distance traveled, calories burned, and pulse rate. The addition of a heart rate receiver to the Velocity rower is an added bonus, especially when you consider the fact that a lot of rowers in this price range don’t come with one. You can also set up a target time, distance, count, or the amount of calories you would like to burn during that workout. Once you’ve hit your goal, the monitor will beep and let you know. The rower offers 12 different workout programs, which you control through the machine’s fitness monitor. These 12 programs consist of 6 pre-programmed workouts, 1 target heart rate program that the fitness monitor will personalize for you based on your target heart rate, 4 open slots for you to customize your own workout programs, and 1 manual program that gives you the freedom to row at your own pace without any restrictions. In addition to monitoring and displaying your heart rate on its LCD monitor while you work out, the machine also allows you to check your pulse recovery rate. Just press the “Pulse Recovery” button on the monitor as soon as you complete your workout. Many people find this function helpful because it tells you how long it takes for you to recover from each exercise. This can help you build a regimen that will better serve your needs and test the intensity of the workout. The test itself lasts for 1 minute, and the results are quickly displayed on the monitor. The machine itself is quiet, and the smooth sliding action of the seat offers a problem-free workout.